All transactions are safe and secure with a reliable history in online purchasing behind each of our associates. Buy the Lucille Ball t-shirt to own I Love Lucy clothing and merchandise. 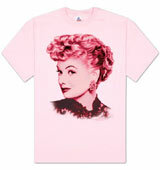 This pink Lucy tee shows us how glamorous Lucille Ball can be regardless of all her zany antics. She may not have realized it but she was just as picture perfect as the celebrities she clamored to meet. Whether she was stalking them during lunch in Beverly Hills or trying to sneak a peek on one of Ricky's sets, she was still beautiful. Let everyone know how beautiful Lucille was with this Lucy T.
In addition to the Lucille Ball tee above, browse the I Love Lucy Clothing Gallery for more apparel like men's and women's clothes, kids shirts or hoodies.